I have a tiny project that need updating – the idcc.co.il website (*). Source control I setup a new git repository on my home machine (using smart-http from git-dot-aspx, a different story for a different post) and now I got to setup a build server. Team city Downloaded TeamCity 5.1.4 (the free, Professional version). Installation was mostly painless, except that the build-agent properties setter got stuck and I had to manually edit the build-agent conf file. No biggie – just RTFM: http://confluence.jetbrains.net/display/TCD5/Setting+up+and+Running+Additional+Build+Agents#SettingupandRunningAdditionalBuildAgents-InstallingviaZIPFile. git integration Git is supported out of the box. I did have a minor glitch – the git-dot-aspx thing is very immature, and it simply did not work. Luckily the repository is located on the same machine as the build server and build agent so I simply directed the VCS root to the location on the filesystem. Fixing the tests only to find that I have a broken test. Since when I created the initial website, I never set a build server, thus some changes I later introduced caused a minor regression. Now that I have a proper build server it (hopefully) won’t happen again. yes, Ohad and myself are setting up a second idcc conference. It is still in stealth mode, but keep you tabs of this. An announcement is planned for early October. Can you spot what will cause the following NUnit test not to run on TeamCity 4.5? Tired of setting up stubs for your class under test? Tired of compile errors when you add one more dependency to a class? The AutoStubber to the rescue. I know there is the AutoMockingContainer, and various other stuff out there, but this thing just was very natural to me, it uses a very simple API (do not need to keep reference to the Container), and took me less than an hour to knock off. An enhancement I consider would be to allow setting pre-created values to some of the parameters. But meanwhile I did not happen to need it. At Yaron Nave’s blog, which is an excellent reading for all things WCF. I’ve refined my “unit testing framework” a bit, to make it less awkward. test(Fact/Test):- current_predicate_under_test(Predicate), retractall(test_def(Predicate/Fact/Test)), assert(test_def(Predicate/Fact/Test)). setup_tests(Predicate) :- retractall(test_def(Predicate/_/_)), assert(current_predicate_under_test(Predicate)). end_setup_tests:- retractall(current_predicate_under_test(_)). run_tests :- dynamic(tests_stats/2), bagof(P/Tests, bagof((Fact/Test), test_def(P/Fact/Test), Tests), TestsPerPredicate), run_tests(TestsPerPredicate, Passed/Failed), write_tests_summary(Passed/Failed). run_tests(TestsTestsPerPredicate, TotalPassed/TotalFailed) :- run_tests(TestsTestsPerPredicate, 0/0, TotalPassed/TotalFailed). run_tests(, Passed/Failed, Passed/Failed):-!. run_tests([P/Tests|Rest], Passed/Failed, TotalPassed/TotalFailed):- write('testing '), write(P),  foreach_test(Tests, PassedInPredicate/FailedInPredicate), write(' passed:'), write(PassedInPredicate), (FailedInPredicate > 0, write(' failed:'), write(FailedInPredicate) ; true), nl, Passed1 is Passed + PassedInPredicate, Failed1 is Failed + FailedInPredicate, run_tests(Rest, Passed1/Failed1, TotalPassed/TotalFailed). foreach_test(Tests, Passed/Failed):- foreach_test(Tests, 0/0, Passed/Failed). foreach_test(, Passed/Failed, Passed/Failed):-!. foreach_test([Fact/Test|Rest], Passed/Failed, NewPassed/NewFailed):- assert((run_test:-Test)), ( run_test, !, NextPassed is Passed + 1, NextFailed is Failed ; NextFailed is Failed + 1, NextPassed is Passed, write('FAIL: '), write(Fact), nl ), retract((run_test:-Test)), foreach_test(Rest, NextPassed/NextFailed, NewPassed/NewFailed). 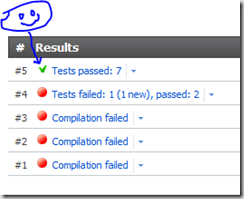 write_tests_summary(Passed/0) :- !, nl, write(Passed), write(' tests passed :)'), nl. write_tests_summary(Passed/Failed) :- nl, write(Passed), write(' tests passed, however'), nl, write(Failed), write(' tests failed :('), nl. reset_all_tests:- retractall(test_def(_/_/_)). :- test('empty and empty returns empty'/( conc(, , ))). :- test('empty and nonempty returns L2'/( conc(, [1,2], [1,2]))). :- test('nonempty and empty returns L1'/( conc([1,2], , [1,2]))). :- test('nonempty and nonempty returns L1 concatenated with L2'/( conc([1,2], [3,4], [1,2,3,4]))). Finally I’m sitting down to be done with my Computer Science degree. I’ve been studying in the Israeli Open University starting 2003, while working full time and more. Over than two years ago I reached the point of having literally no time at all to finish it up, so I left it to be with only two final projects to complete, present and defend. The first one is to write a simple AI enabled game (using depth delimited alpha-beta algorithm variation) , in PROLOG. Back when I took that course, the whole paradigm was too strange to me. I’ve been doing procedural and OO coding for years, and the look of the programs just looked …. wrong. Nowadays that I developed a lot of curiosity into declarative languages like Erlang and F#, (and being a much better and way more experienced developer) I can relate to that type of coding more easily. So, dusting the rust of two year of not touching it at all, I sat down today to start working on that project (delivery is next month), I started with writing down a small helper for running unit tests on my code. (TotalFailedAtEndCount> 0, write_fails(TotalFailedAtEnd) ; write('Alles Gut'), nl). NewX is X + 1, assert(tests_passed(NewX)). Ahm. A failing test …. back to work I guess. btw, The game I am implementing is Kalah. Usually I won’t just link to another’s post, but this one is a very good introductory level Unit Testing 101 Article, covering basics of the idea, and basic of nUnit and Rhino.Mocks. A must read for Unit Testing newbies.